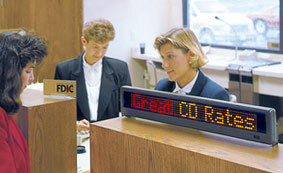 In a recent study, statistics show that LED Signs placed inside banks, repeatedly increase awareness in products and services. Moving LED Signs attract better than static signage, while reducing the overall cost. Adaptive displays allow you to show real-time market data, proprietary information, news headlines and messaging with our comprehensive line of indoor and outdoor display systems.